Double Horseshoe ring perfect for the western admirer in your family. Who says you can't double your luck! 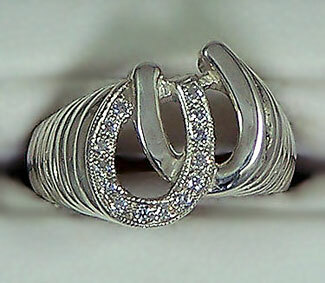 How about this Double Horseshoe Ring beautifuly set with cubic zerconia. Lots of bling for the money. Dimensions: 12mm wide at the top tapering down to 5.5mm on the bottom of the ring. Pictured and priced in STERLING SILVER ring is set with CUBIC ZERCONIA!